Next Generation HALT and HASS presents a major paradigm shift from reliability prediction-based methods to discovery of electronic systems reliability risks. This is achieved by integrating highly accelerated life test (HALT) and highly accelerated stress screen (HASS) into a physics-of-failure-based robust product and process development methodology. The new methodologies challenge misleading and sometimes costly mis-application of probabilistic failure prediction methods (FPM) and provide a new deterministic map for reliability development. The authors clearly explain the new approach with a logical progression of problem statement and solutions. The book helps engineers employ HALT and HASS by illustrating why the misleading assumptions used for FPM are invalid. Next, the application of HALT and HASS empirical discovery methods to quickly find unreliable elements in electronics systems gives readers practical insight to the techniques. The physics of HALT and HASS methodologies are highlighted, illustrating how they uncover and isolate software failures due to hardware-software interactions in digital systems. The use of empirical operational stress limits for the development of future tools and reliability discriminators is described. Key features: * Provides a clear basis for moving from statistical reliability prediction models to practical methods of insuring and improving reliability. * Challenges existing failure prediction methodologies by highlighting their limitations using real field data. * Explains a practical approach to why and how HALT and HASS are applied to electronics and electromechanical systems. * Presents opportunities to develop reliability test discriminators for prognostics using empirical stress limits. * Guides engineers and managers on the benefits of the deterministic and more efficient methods of HALT and HASS. * Integrates the empirical limit discovery methods of HALT and HASS into a physics of failure based robust product and process development process. Next Generation HALT and HASS presents a major paradigm shift from reliability prediction-based methods to discovery of electronic systems reliability risks. This is achieved by integrating highly accelerated life test (HALT) and highly accelerated stress screen (HASS) into a physics-of-failure-based robust product and process development methodology. The new methodologies challenge misleading and sometimes costly mis-application of probabilistic failure prediction methods (FPM) and provide a new deterministic map for reliability development. The authors clearly explain the new approach with a logical progression of problem statement and solutions. The book helps engineers employ HALT and HASS by illustrating why the misleading assumptions used for FPM are invalid. Next, the application of HALT and HASS empirical discovery methods to quickly find unreliable elements in electronics systems gives readers practical insight to the techniques. The physics of HALT and HASS methodologies are highlighted, illustrating how they uncover and isolate software failures due to hardware-software interactions in digital systems. The use of empirical operational stress limits for the development of future tools and reliability discriminators is described. * Provides a clear basis for moving from statistical reliability prediction models to practical methods of insuring and improving reliability. * Challenges existing failure prediction methodologies by highlighting their limitations using real field data. 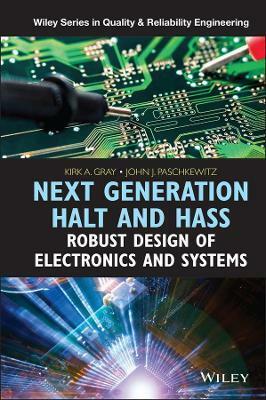 * Explains a practical approach to why and how HALT and HASS are applied to electronics and electromechanical systems. * Presents opportunities to develop reliability test discriminators for prognostics using empirical stress limits. * Guides engineers and managers on the benefits of the deterministic and more efficient methods of HALT and HASS. * Integrates the empirical limit discovery methods of HALT and HASS into a physics of failure based robust product and process development process. Kirk A. Gray, Accelerated Reliability Solutions, L.L.C., Colorado, USA Kirk Gray has over 33 years of experience in the electronics manufacturing industry. He began his career in electronics in semiconductor manufacturing equipment and progressing to validation and reliability testing at the system level. Starting in 1989 he worked closely with Gregg Hobbs Ph.D., the inventor of the methods of Highly Accelerated Life Test (HALT) and Highly Accelerated Stress Screening (HASS) at Storage Technology and later QualMark. He has been teaching, consulting, and applying HALT and HASS since 1992. He holds a Bachelor of Science in Electrical Engineering from the University of Texas at Austin and is a Senior Member of the IEEE. He was a past Chairperson of IEEE/CPMT Technical Committee on Accelerated Stress Testing and is a Senior Collaborator with the CALCE Consortium at The University of Maryland. He is the owner and Principal Consultant at Accelerated Reliability Solutions, LLC John J. Paschkewitz, Reliability Consultant, Missouri, USA John J. Paschkewitz has over 40 years experience in product assurance, testing, reliability and sustaining engineering in several industries. He has been applying HALT and HASS since 1998. He holds a B.S. in Mechanical Engineering from the University of Wisconsin - Madison and a M.A. in Business Management from Central Michigan University. He is a registered Professional Engineer and ASQ Certified Reliability Engineer (CRE), a Senior Member of ASQ and a Member of SAE and ASME. He is now owner and Principal Consultant of Product Assurance Engineering, LLC.